United States Naval Station Tutuila was a naval station in Pago Pago Harbor on the island of Tutuila, part of American Samoa, built in 1899 and in operation until 1951. During the United States Navy rule of American Samoa, from 1900 to 1951, it was customary for the commandant of the station to also serve as Military Governor of the territory. Benjamin Franklin Tilley was the first commandant and the first officer responsible for the naval station's construction. 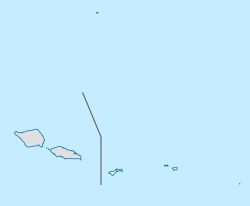 Post-war Tutuila's military importance continued to decline, and in 1951, control of American Samoa was transferred from the Navy to the Department of the Interior. Naval Station Tutuila was closed, and the last scheduled naval transport, the General R. L. Howze, sailed on 25 June 1951. The harbor has since returned to commercial use. ^ "Pago Pago (American Samoa)". Britannica Online Encyclopedia. Retrieved 21 August 2010. ^ a b c "Annexation of Samoa". globalsecurity.org. Retrieved 21 August 2010. ^ a b c Franco, Robert W. "Samoans, World War II, and Military Work". University of Hawaii at Manoa. Retrieved 21 August 2010. ^ Enright, John (March 15, 2011). "Tutuila in WWII: In the Cross-hairs of History – Part 1". Samoa News. Archived from the original on January 30, 2014. Retrieved November 27, 2014. ^ "The World at War : Samoa 1898-1951". schudak.de. Retrieved 21 August 2010. ^ "U.S. Naval Station Historic District". Fodor's. Retrieved 25 October 2017. ^ "NRHP nomination for US Naval Station Tutuila Historic District". National Park Service. Retrieved 19 May 2015. ^ "NHL summary description of Government House". National Park Service. Archived from the original on 5 October 2012. Retrieved 19 May 2015.